HammerHead 24oz Steel Insulated Bottle is rated 5.0 out of 5 by 7. 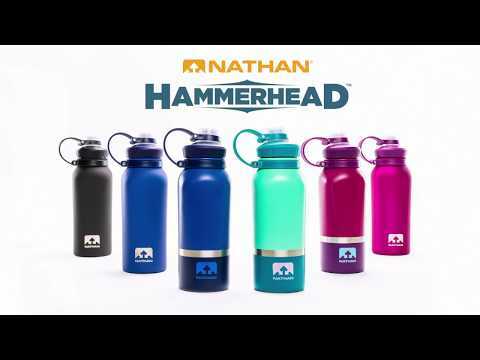 Rated 5 out of 5 by Anonymous from Keeps drinks cool longer than any bottle I've ever had I've had plenty of metal water bottles that claim to keep drinks cool for a long time, I was skeptical about the Hammerhead being any better but WOW. I filled mine up with ice and water the first day I got it, then left it at the office with the drinking spout open. I came back the next day and the ice inside was barely even melted and the water was ice cold! I love the lid design and the grippy finish on the black option is perfect. I'll be taking it everywhere with me from now on. Rated 5 out of 5 by MG_CHI from Love this bottle! I bought this because I was sick of plastic bottles that kept getting nasty growths inside of them. The stainless steel material is great for preventing growth but also is easy to thoroughly clean. The bottle doesn't impart any taste on water and it's easy to fill and drink from. The drinking opening is nice soft silicone type material that feels nice against the mouth but it is also washable. The piece can be removed and washed so there are no hidden areas that can't get cleaned. Rated 5 out of 5 by runrdes from Desert Summer Tested I got the 24oz bottle to use around, and I loved it so much that I got 2 of the 40oz bottles as well. They have stood the test of being left in a car in the direct sun on a 117 degree Arizona day and still having cold water for me when I come back. It's great for both post-run or a mid-run fill up. Rated 5 out of 5 by JustMe from Keeps my water ice cold I bought this because after my long run there is nothing I want more than ice cold water. And with this water bottle, I'm able to get exactly that. My only issue is that I wish it was narrow enough to fit in the cup holder of my car. But since it doesn't sweat, I just leave it in the passenger seat. Rated 5 out of 5 by porfyra from Great quality ! I got this as a gift and love it. Good quality material, great color and handgrip. I use it for keeping cold water during my running sessions or shifts at work. Every time I drink from it its like drinking water straight from the fridge, its amazing for how long water can stay cold in it. Rated 5 out of 5 by Anonymous from HammerHead 24oz Steel Insulated Bottle For years, I had hoped to find the right bottle that doesnâ€™t leak, keeps drinks cold (and hot), and has something to protect the spout - keep germs off it, esp when traveling. THIS BOTTLE DOES IT ALL! Love it! Rated 5 out of 5 by Deborah B. from Review Love this bottle! Kept my water cold on a hot day in the forest. Excellent product!